I have a habit of flipping through fat, paperback movie guides, looking for mini-reviews of my favourite films. You know these books: Leonard Maltin produces one; so do Roger Ebert and a few other film critics. Movies are listed alphabetically, each receiving a hundred words or so, plus a star-rating. ‘With sympathy.’ You could almost see the bland regret on the reviewer’s face, before he left his chair for a sandwich and a Godard marathon. It hurt me. As a silent movie fan, I want to believe greatness is everlasting. The failure of a once-formidable blockbuster to move modern audiences is akin to a fall from grace. It’s ignoble. But The Great Train Robbery is more than a curious antique, I think. Its title is a descriptor. It is a robbery caper that begins the instant the title screen goes black, with a pair of robbers bursting into a telegraph station, and binding and gagging the railway dispatcher. They use his equipment to stop a train at a secluded water tower along its route. Other members of the gang board the train, detach the engine from the passenger cars, and rob the passengers. 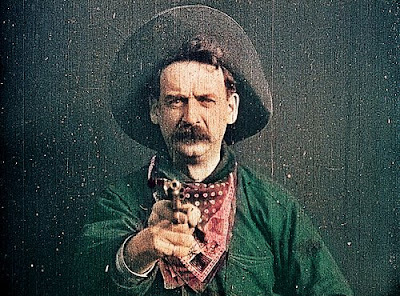 Director Edwin S. Porter produced a film that is, at twelve minutes, unusually long for its time; it has a fully developed narrative and distinguishable characters, or at least character types—robbers, posse-members, railway workers and assorted civilians. 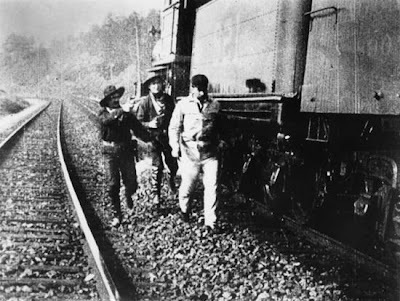 The Great Train Robbery also features rudimentary cross-cutting (that is, cutting from one scene to another to suggest simultaneity and to build suspense); film narratives prior to this were usually linear, and if the director chose to portray two events occurring at the same time, he simply showed them from start to finish, in succession. But much of this boils down to film history--in effect, praising the film for not looking so old to modern eyes. What’s The Great Train Robbery really like? What are its artistic achievements, irrespective of the time in which it was filmed? The Great Train Robbery is set apart by its mixture of archaic and modern. Particularly the sharp contrast between traditional stagecraft and more experimental film techniques. It’s a quilt. Its opening scene is an obvious set with a painted clock over the telegrapher’s head; actors are filmed at a distance equivalent to that between the stage and a good seat in a big theatre. Gestures are dramatic and outsized. But to the right is a large window, and through it we see other trains passing by. This is not a set piece—it’s footage. Porter’s use of double exposure brings reality to the scene, even though the room itself is an obvious cartoon. The next scene presents complete juxtaposition, as we move from a set to an outdoor location with a real water tower. And then we’re back to artifice, as the criminals board the express car (where any loot would be stored) and shoot the messenger. The train car is another flat backdrop; the curvature of its roof is a trick of perspective. But the loading door of the car is open, and through it we can see real trees speeding by. In what must have been, for the time, a remarkable shot, we next see the robbers overpower the conductor atop the engine, while the train is moving. We’re again looking at the real thing, and continue to as the train halts,and the passengers pour out in a great herd, hands high, waiting to be robbed. 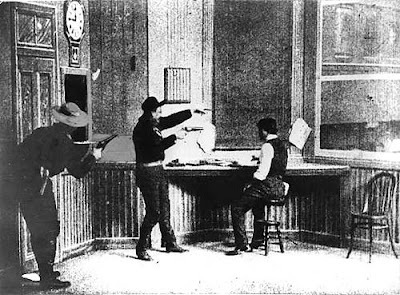 The robbery scene highlights Porter’s main artistic weakness: the obsessive need to film events in their entirety, even when snippits would have told the story. On stage, this scene would have been punctuated with dialogue to keep our attention. But here, filmed with an immobile camera set at long range, it makes us fidget. Yet it shows inspiration, too. The crowd of passengers is immense, but they flow out of the train car like the contents of a cracked piñata—which, for the robbers, is exactly what they are. The thieves pull away in the engine, abandon it down the line and head for their hideout in the woods. This is another outdoor scene, following the thieves as they skip down the valley with their stolen goods, across logs and over brooks. The camera moves to keep them in frame—stiffly, yes, but at least it’s moving. That was rare for 1903. From these outdoor scenes we return again to the stage. The telegrapher, still bound face down on the floor of his office, is saved by the arrival of his young daughter. She’s dressed in vibrant, oscillant purple—the product not of Porter’s art, but a painter’s, who hand-coloured the film cells that make up this print. The telegrapher alerts the locals to what has happened—interrupting a square dance attended by women in painted yellow dresses, jigging in front of a painted stove. A posse is formed and the robbers are gunned down in the hideout, amid explosions of bright red and orange. There’s one last scene, of course—the one for which The Great Train Robbery is today most famous. With the criminals finished off in the forest, Porter cuts to a close-up of one more varmint, looking straight at the camera. 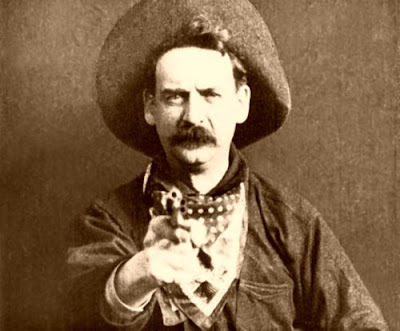 He raises his pistol, and fires at the audience. Were theatregoers of the time ‘thrilled’ or ‘terrified’ by this? Some probably were. Had the audience been more accustomed to films, it’s said, they would not have reacted so strongly. But too many people describe the scene as though its value lies solely in shock. Its power lies not simply in its capacity to break the fourth wall; it is the film’s only close-up, and as such, pulls us violently from our positions as passive observers. We were content to watch the murders, safe in our distance from them—now, we’re being gunned down ourselves. This is Porter’s finest piece of juxtaposition, and for this bit of art, at least, The Great Train Robbery may reject the sympathetic eye. The Great Train Robbery is the centrepiece of several, film history-themed DVD anthologies. My favourite (and the one on which this article is based) is found on Disc One of Kino International’s must-have, four-disc set, Edison: The Invention of the Movies. The film is preceded by a short commentary from several film scholars. Look for it here.